The Church ruled over many European territories, not just the Papal States. There were dozens of prince-bishops in the former Holy Roman Empire, now Germany and some surrounding countries. 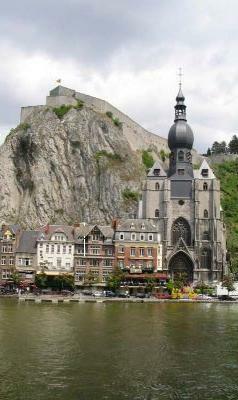 For instance, the picturesque little town of Dinant in modern Belgium was ruled by Prince-Bishop of Liège. Naturally, where a cleric reigned, a concordat between the pope and the ruler was not necessary. 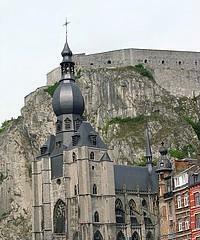 Napoleon finally freed the citizens of Dinant from their Prince-Bishop and gave them secular government under French rule. He also put them under his Concordat of 1801. Then in 1815 their nationality was changed again. After the end of Napoleon's empire the Netherlands and Belgium were joined to form United Kingdom of the Netherlands to better withstand any new threat from France. Soon after this, the Dutch erected on the cliff the fortifications, which can still be seen today. They made the fort low-slung to resist cannonades and cut a series of 408 steps into the solid rock down to the town below. From concordat to "officially recognised and subsidised religions"
The lapsed concordat with Napoleon two centuries ago casts a long shadow and still hinders the separation of church and state in Belgium. 1. Michel Kellner and Jacques Olivier, "Chronologie Dinant". The chief difficulty with which the king had to contend throughout this period was the ceaseless and irreconcilable opposition of the Catholic hierarchy and clergy to the principle of absolute religious equality established by the Fundamental Law [Constitution of 29 March 1814] (Articles CXC-CXCIII). Their leader, Maurice de Broglie, Bishop of Ghent, actually published a jugement doctrinal in which he declared that the taking of the oath to the Constitution was an act of treason to the Catholic Church. In this defiance to the government he had the support of the Pope, who only permitted the Count de Méan to take the oath on his appointment to the Archbishopric of Malines on the understanding that he held Articles CXC-CXCIII to refer only to civil matters. For another example of the Vatican actively encouraging a Catholic region to secede from a federation with a more secular partner, see "Why Slovakia?" 3. Maurits van Haegendoren, "Ethno-linguistic cleavage in Belgium", Case Studies on Human Rights and Fundamental Freedoms: A World Survey, v. 2, (The Hague, 1976), p. 6.